Opened as a variety theatre in 1904. Designed by Bertie Crewe to seat 2,000. Used as cine-variety from 1914. Sold to H Maitles, January 1930. Closed in 1962, then bingo until closure and demolition in 1976. 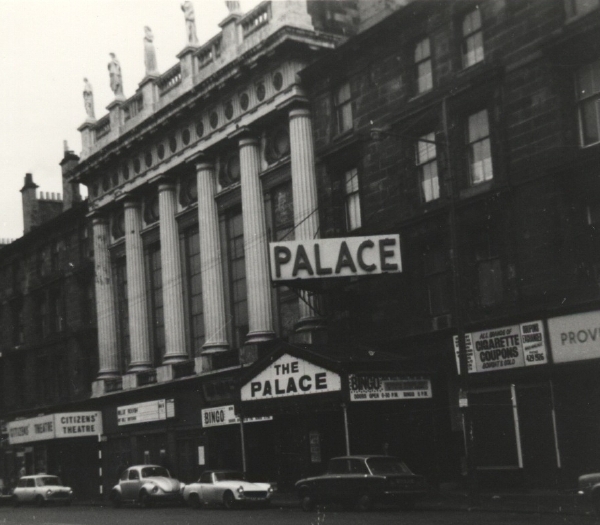 The Palace was right next door to the Citizens Theatre, which which it shared the monumental facade pictured above. When the Palace - and the facade - were demolished, the statues were rescued and re-sited in the foyer of the Citizens. Another picture can be seen here.